Astronaut Scott Kelly, 143 days into a planned 341-day stay aboard the International Space Station, urged lawmakers Monday to restore full funding to NASA's commercial crew program to avoid expected launch delays and continued sole reliance on Russia for transportation to and from the International Space Station. In an interview with CBS News, Kelly said the commercial crew program "is very important to us" and while "I hope we'll get there with the current funding, I don't think we'll get there on the current schedule, obviously, or the schedule we would have liked." "But it is very important, and hopefully people will recognize this and give NASA the support we need to get it done," he said. Closer to home, Kelly and his crewmates are standing by for the launch Wednesday of a Japanese H-2B rocket carrying an automated HTV cargo ship loaded with 4.5 tons of supplies and equipment. Liftoff from the Tanegashima Space Center in southern Japan is targeted for 7:50 a.m. EDT, weather permitting, with arrival at the space station early Monday. The flight is especially important given the back-to-back failures of a Russian Progress supply ship last April and the loss of a SpaceX Dragon cargo ship in June. Russian Progress flights resumed July 3 and two more flights are planned before the end of the year. But a successful HTV launch and berthing is needed to avoid shortfalls that otherwise could be expected this fall. "We're in good shape right now, but if for some reason HTV didn't get here, we get pretty low on certain consumables probably in late September, early October timeframe," Kelly said. "I'm sure we would figure out ways to bridge the gap on those things. ... But if for some reason HTV gets delayed for a significant amount of time or something else happens, we do run into some issues. "We've been pretty good about dealing with those things, and I'm sure we will, we would figure out a way around it, but it is a very important launch for us coming up." In the wake of the Bush administration's decision to retire the shuttle, NASA funded development of commercial cargo ships to replace the lost capability of its winged orbiters and a separate program to develop commercially managed crew ferry ships. Boeing and SpaceX won a combined $6.8 billion in NASA contracts in 2014 to develop crew capsules to carry U.S. and partner astronauts to and from the space station. Initial test flights are targeted for 2017, two years later than initially planned because of earlier budget shortfalls. The current 2017 launch targets assume NASA gets $1.2 billion in funding in fiscal 2016 as requested. As it currently stands, draft legislation in the House would cut that to $1 billion while the Senate has earmarked $900 million. As a result, NASA recently extended its contract with Roscosmos, the Russian federal space agency, informing Congress that it plans to spend another $490 million to secure six more Soyuz seats for U.S. and partner astronauts through 2018 and landing support into 2019. That's on top of a $458 million contract last year for six seats through the end of 2017. The average cost per seat under the latest contract extension is nearly $82 million. In a letter to Congress Aug. 5, NASA Administrator Charles Bolden said "for five years now, the Congress, while incrementally increasing annual funding, has not adequately funded the commercial crew program to return human spaceflight launches to American soil this year, as planned." "This has resulted in continued sole reliance on the Russian Soyuz spacecraft as our crew transport vehicle for American and international partner crews to the ISS," he wrote. He said the proposed 2016 budget "would result in NASA's inability to fund several planned (contract) milestones in FY 2016 and would likely result in funds running out for both contractors during the spring/summer of FY 2016." "If this occurs," he said, "the existing fixed-price contracts may need to be renegotiated, likely resulting in further schedule slippage and increased cost." Asked if the funding shortfall might force NASA to proceed with a single contractor at some point, Kelly agreed "that would be a concern." "I would imagine that would eat into some of your margin for success," he said. "If you have two vehicles being built and one of them doesn't work out, you've still got the other one and down selecting earlier than we'd like would probably make that ... less of a likelihood we'd get the vehicle we want in the time that we would want." Space has not yet been widely discussed by presidential candidates, but Kelly urged them consider the program's value and support the necessary funding to keep it on track. "What we get from building a space station, the economic return, the science return is very, very important to our nation, to our economy," he said. "I would like to see all the candidates, really, support us, and I think they probably do in some regard, but also support a bigger budget with the commercial crew (program) and being able to build that vehicle on the time frame that we need to to support our ... future missions. "We need to be able to put that money into the U.S. economy and U.S. companies versus sending it overseas," he said. "So I hope they would see that." Politics aside, Kelly said he's in good spirits, feeling fit and looking forward to the remainder of his mission. 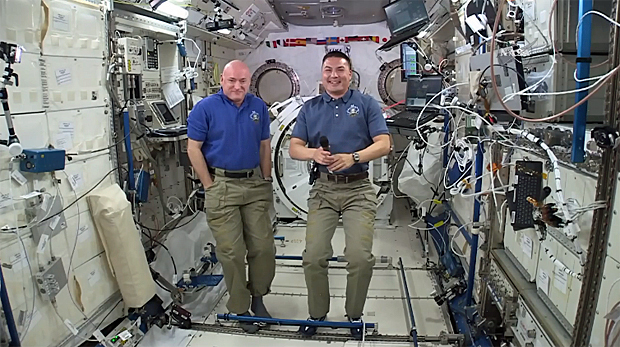 Kelly and crewmate Mikhail Kornienko are spending nearly a year aboard the space station to help researchers learn more about the long-term effects of weightlessness and space radiation. Before launch, Kelly said he worried a bit about running out of steam after four months or so, but so far that has not been the case. "Things are going great," he said. "I have a lot of energy, I'm able to focus, I think I have a pretty good attitude about it. A year's a long time, but I'm still looking forward to the rest of this flight. We've got a lot of great things coming up that we're going to do and it's been a great experience so far." Among his research chores, Kelly is participating in research to figure out what causes eye problems for some long-duration astronauts and cosmonauts. Scientists suspect it's caused by increased pressure in the cranium, due to fluid shifts in weightlessness, that compresses the optic nerve and eyeballs. Asked if he has experienced any problems, Kelly said his distance vision seems to have improved in space. "I actually think it's noticeably a little bit better ... than it was on the ground and a little bit better than it was earlier in the mission," he said. "I'm actually thinking about maybe on a spacewalk not wearing my glasses. I normally wear those both for reading and a little bit of a distance correction, but the distance vision seems like it's gotten a little bit better. So I might go without."